18 holes at Wilderness Ridge. Lanyards supplied by sponsoring organization for conference attendees to wear with their name badges. Logo posted at dinner for recognition. 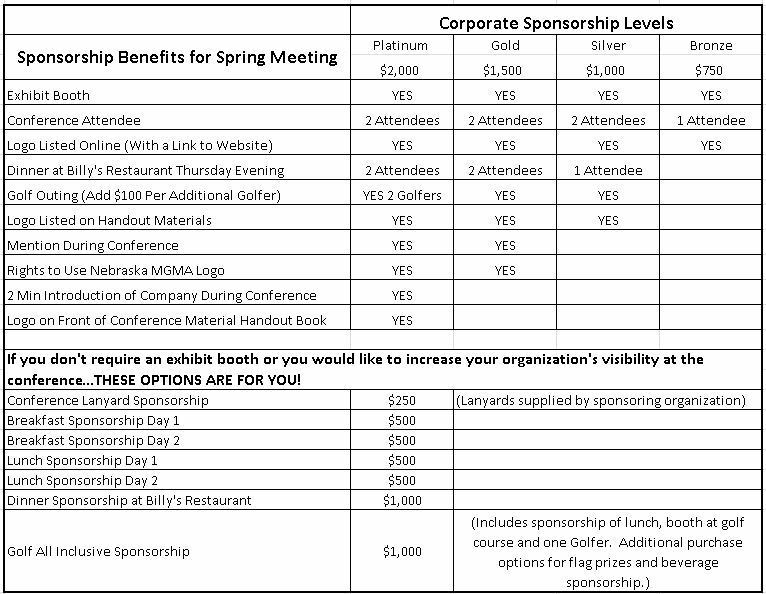 Includes sponsorship of lunch, booth at golf course and one golfer. Have your logo displayed on the breakfast buffet and additional time to network. Have your logo displayed on the lunch buffet and additional time to network. Only necessary if your sponsorship level does not include this. Only necessary if you have more than 2 people eating lunch. Any booth sponsorship will include welcome reception on Wednesday evening and breakfast, breaks, and lunch on Thursday for two people. This is a great opportunity for you to display your products and services, and get better acquainted with our more than 170 active members. Our membership consists of clinic managers from both physician-owned and hospital-owned clinics. About 80 members are expected to attend. Exhibitor booths are open to our members on Thursday, May 9, from 7:30 AM until 2:00 PM. If you want to register for multiple sponsorship types you will have to pay and then register for your additional request. Please respond to registration email with names of those attending. 5:30 PM Welcome Reception at The Cornhusker Exhibitors & Sponsors are Welcome!